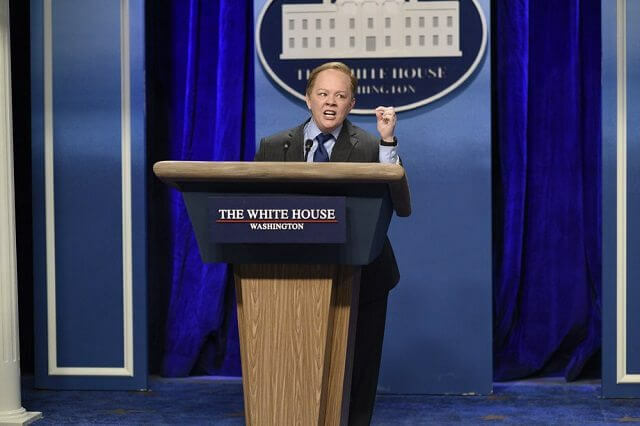 West Coast and Mountain time zone audiences will finally be able to see NBC’s Saturday Night Live the way East Coasters have always enjoyed being able to do. NBC just announced SNL will be broadcast live in all time zones for the final four episodes of the current season. The network also announced the final episodes of the season will be hosted by Jimmy Fallon (April 15), Chris Pine (May 6), Melissa McCarthy (May 13), and Dwayne Johnson (May 20). SNL season 42 has scored the highest ratings in 24 years, thanks in large part to its skewering of Trump (played convincingly by Alec Baldwin). This season is averaging 11 million viewers, up 21% in adults 18-49 and 2.2 million in total viewers. The April 15 and May episodes will air live at 11:30pm Eastern, 10:30pm Central, 9:30pm Mountain, and 8:30pm Pacific. SNL will repeat in the 11:30pm timeslot in the Pacific and Mountain time zones.